“Cyberpunk is far bigger than anything else that CD Projekt Red has done before,” said visual effects artist Jose Teixeira, talking to MCV. “Far, far bigger. “We’re really stepping into the unknown in terms of complexity and size and problems we encounter,” he continued. To honest, we wonder whether making a game much bigger than The Witcher 3 would actually be a good thing, as impressive as it would be from a technical perspective. Given Cyberpunk’s sci-fi setting, those urban landscapes would surely benefit more from detail than from scale? We’ll have to wait and see. 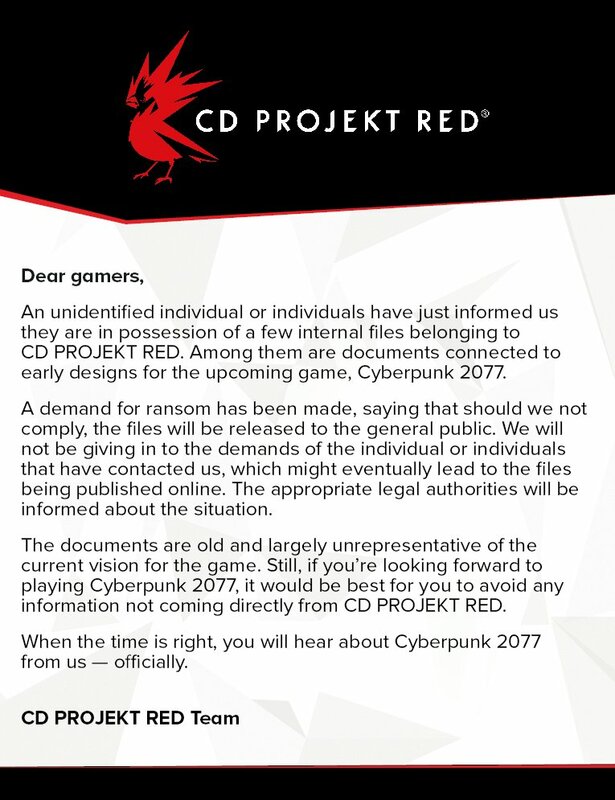 In any case, CD Projekt Red says it can take what it learnt from The Witcher 3 into making Cyberpunk 2077. “The Witcher helped Cyberpunk quite a bit, because the game got so big and so complex that it really taught us,” Teixeira explained. We certainly hope so, because we’re really excited to see what CD Projekt Red is doing with the game. Expect it to be some time before we actually get a chance to see anything of the game, though. Cyberpunk pour moi c'est une véritable machine à rêves depuis son annonce et je suis bien content qu'ils prennent leur temps. Quand je vois le boulot de dingue qu'ils ont accompli sur The Witcher 3 et le fait que le projet sera encore plus gros ça donne limite le tournis. J'ai hâte qu'ils commencent à vraiment communiquer dessus pour au moins connaitre les grandes lignes pour en avoir un aperçu global. Avec la maitrise que la studio a désormais acquise et tout le background cyberpunk, ça ne peut que déchirer. De tout façon CD Project a toute ma confiance. Par contre on est pas prêt de le voir arrivé, perso je table pour 2020. Are you thinking about Cyberpunk already ? Marcin Przybylowicz : My superiors already force me to do it, because I spend most of my time with Geralt; however, some first attempts with Cyberpunk were already made. CD PROJEKT RED is looking for a talented Gameplay Programmer to join our outstanding team in Warsaw. The person in this position will cooperate with Gameplay & Level Designers teams to create the whole architecture of vehicle related code, and the physics of driving / flying in those vehicles. Je me retiens régulièrement (mais vraiment) de dire encore une fois que "ça va tout tuer". Donc je le dis une dernière fois, normalement. Mais ça ne peut QUE tout défoncer, avec tout le savoir qu'ils ont emmagasiné sur les Witcher. On n'a rien vu sortir du coup ? Ce n'est pas plus mal ceci dit.